HONOLULU (HawaiiNewsNow) - The No. 14 University of Hawai'i women's volleyball team (19-5, 12-1 Big West) swept UC Irvine (10-17, 5-8 BWC) on the road for its seventh-straight victory, 25-14, 25-13, 25-18 on Thursday night at the Bren Events Center. Hawai'i did not ease up on the gas pedal and started right where they left off last weekend. Reigning Big West Player of the Week Annie Mitchem tied her career-high with a match-high 13 kills and Emily Maglio tied her career-high with a match-high nine blocks to lead the Manoa Roofing Company. UH out-blocked the Anteaters, 14.0-to-1.0. The win brings head coach Dave Shoji's career record to 1,198-203-1, just two wins shy of becoming only the second coach in NCAA DI history to record 1,200 career wins. For the second time in UH's last three games, Mitchem did not commit a hitting error for the match. She hit .481 with 13 kills on 27 attacks. Mitchem also added a pair of service aces, four blocks and two digs. She is now just three kills shy of her 200th career kill for Hawai'i. In the last three matches, Mitchem is hitting .459 (38-2-74). Nikki Taylor added 11 kills and hit a season-high .733 with no errors in 15 swings. It is the second straight match that Taylor has not committed a hitting error. Her 11 kills also made her just the 12th player in Rainbow Wahine history to record over 1,300 kills. Taylor entered the match with 1,290 kills in her four year career and now currently has 1,301. She finished the match just one dig shy of a double-double with nine, but also added seven blocks and a service ace. It marked the 15th time this season that she's recorded double-digits in kills. Setter Norene Iosia tallied her team-leading, ninth double-double of her rookie season. She dished out 28 assists to go with her 11 digs while helping to lead Hawai'i to a .382 hitting percentage for the match. She also had a kill and a block. Maglio, who entered the match leading the league in blocks and blocks per set, added to her lead rejecting nine Anteater swings in the sweep. As a team, for the second-straight match, UH held their opponents to just one block for the entire match. Hawai'i finished the match just 1.5 blocks short of tying their season-high of 15.5 set in UH's five-set match at Long Beach State earlier this year. As a team, for the second straight match, UH tied their season-low, committing just six hitting errors. 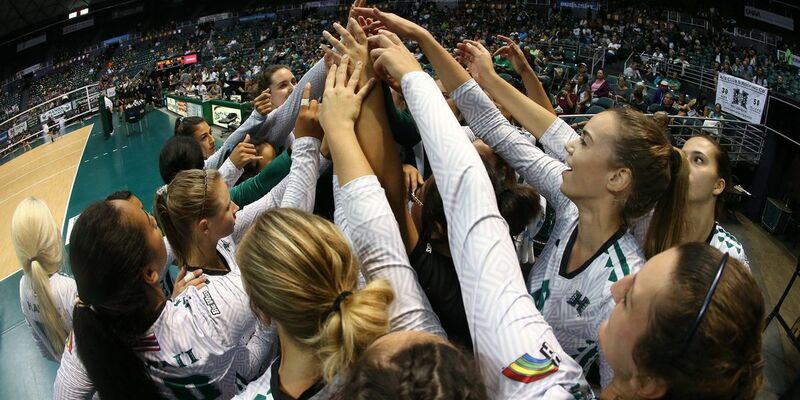 The Rainbow Wahine out-hit UC Irvine percentage-wise, .382-to-.067. In fact, Hawai'i did not record a hitting error until the score was 11-5 in the third set. Hawai'i has now won 19-sets in a row and has swept its last six opponents. The set streak started after UH fell to UCI in the third set in their match in Honolulu (Oct. 14), 24-26. The Anteaters were led by Harlee Kekauoha's nine kills. She and teammate Shelley Anderson combined for their team's lone block, which came late in the third set. Hawai'i will fly up to face UC Davis on Saturday, Nov. 12 at 5:00 pm HT. The Aggies evened their record at 13-13 earlier this week with a win over UC Riverside on Tuesday. UCD is in fifth place in the Big West with a 6-7 record.